Back to School? Schedule a Dental Appointment! Back to School? Schedule a Dental Appointment for Your Kiddo! Dental Appointment: It’s that time of year again! As the summer draws to an end and the school season approaches, we enter this transitional and sometimes frenzied time of year. Students from preschool through college prepare to reenter the world of academia. While unpopular among the majority of kids, these first few weeks in August can come as relief to parents. As some parents may be struggling to balance a busy work schedule along with the rigors of being a full-time parent. Despite hustle and bustle of the back to school month, this might be the opportune time to schedule that recommended dental appointment for your kiddo! In this busy time of year, certain resources and services tend to become scarce; such as stores carrying school supplies, or availability for doctor or haircut appointments. As you can imagine, dental services are certainly no exception. Before the school semester begins, we typically see a significant spike in the number of dental appointments scheduled at Overland Park Dentistry. Parents and college students scramble to book appointments during this time. Related Article: Back to School Dental Appointments – Don’t Procrastinate! Health care requirements: While the exact health requirements may vary slightly from one school district to another, typically many school districts recommend that the students receive a standard dental exam prior to or early within the fall semester. This is done not only to ensure the student’s overall oral health, but also to check for any underlying heath concerns that dentists are specially trained to look for. Easier for the kids: If you were to think back to your time as a student, you might remember that the academic curriculum often starts with lighter more introductory activities. Then it proceeds to cover more advanced content as the semester progresses, often leading up to midterm and final exams. This early part of the semester is sometimes called the “academic grace period” and often proves itself to be the ideal time to get those routine dental appointment checkups out of the way, before the students become enthralled in preparing for any major exams. Catching issues early: While this might seem obvious, taking the time to catch or prevent any future issues or complications is always a good idea. This is especially true with busy students during the school semester. Nothing can disrupt someone’s daily activities like a nagging toothache! By receiving the recommended early dental appointment, you might be sparing your kids from any future tooth problems or potential distractions. 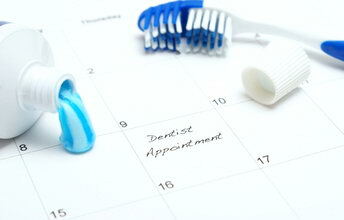 Of course, it’s important to schedule bi-annual dental appointments for you and your family. Click here for the reasons why. As the school year approaches and those long summer days come to an end, obviously there is much to do for students and parents. However despite this few weeks being a busy and often hectic time, you should still try to find time to schedule that coveted early dental appointment for your kids while you still can! Remember when it comes to school, it’s never good to procrastinate, so schedule your dental appointment today! We look forward to having the opportunity to help you and your family during your bi-annual dental appointments or with any preventative, restorative or cosmetic needs you may have. To schedule a dental appointment, contact us at our south Overland Park office at (913) 647-8700 or our north Overland Park office at (913) 341-2380.